Today’s behavioral economics foundations episode is all about the optimism bias. I hope you’ve got your rose colored glasses, because here we go! This is one of those topics that has a name that makes it seem like you MIGHT know what it is…but you potentially don’t know for sure…and you probably don’t realize how much it impacts you and your customers every day. So, what is optimism bias? Essentially, this is our tendency to overweight the likelihood good things will happen to us, and underestimate the likelihood bad things will happen to us. 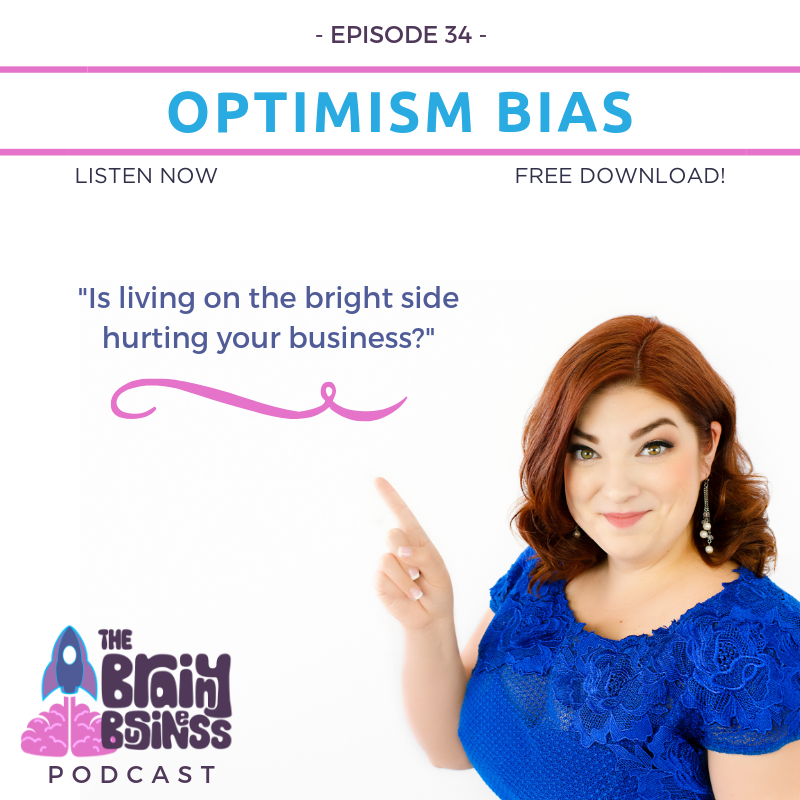 This episode explores why we think this way and how understanding optimism bias can be used to improve our businesses. 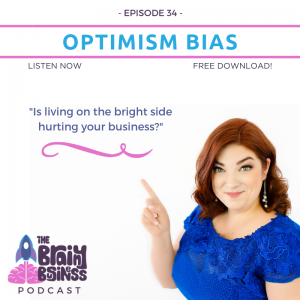 [05:25] OPTIMISM BIAS – This is one of those topics that has a name that makes it seem like you MIGHT know what it is…but you potentially don’t know for sure…and you probably don’t realize how much it impacts you and your customers every day. [05:31] This is our tendency to overweight the likelihood good things will happen to us, and underestimate the likelihood bad things will happen to us. [06:34] It is important to note that optimism bias is not the same as being an optimist. And, if you consider yourself to be a pessimist or a realist…it doesn’t mean that you are not impacted by the optimism bias. It just might impact you a little bit differently. [07:08] Marriage is a great example of optimism bias. In spite divorce statistics, no one thinks that they are going to get divorced when they get married. [07:57] According to the CDC, 1 in every 4 deaths is due to heart disease, claiming 610,000 lives each year. Do you think the statistic will affect you? Your spouse? Parents? Close friends? Probably not. [08:36] We also think our children are uniquely talented and skilled – that they will grow up to change the world and do amazing things. [10:08] Optimism bias means that deep down, ingrained in our DNA, we believe that we have a unique ability to do better and be better than everyone else. [13:16] Optimism bias is believing that you are uniquely going to do better than the odds. [14:01] What my social media followers said they were most interested in concerning optimism bias. [14:51] The first question is the over/under. At least 80% of us are impacted by optimism bias (but I say it hits everyone at least once in their lives). [15:36] For all the entrepreneurs listening – we are likely to be the serious optimism biasers of the world. We believe we can launch or create something no one ever has. [16:00] The “low expectations” theory – debunked. Turns out people with high expectations are happier than those with low expectations. [16:32] When someone with high expectations succeeds, they tie that back to their own abilities and traits. [16:55] When people with high expectations fail a test they think that they’ll do better next time. [17:05] People with low expectations think if they fail it’s because of something they are lacking. [17:26] Optimism and success are not just related – success is built on optimism. [18:06] People who use optimism and the optimism bias, who have high expectations, are happier. [18:23] However, optimism bias can cause people to make bad decisions and take bigger risk than they should. [19:21] Another way the optimism bias shows up in business is when we estimate how long something will take. [21:06] Why do we make to-do list with so many tasks that we’ll never get through them? It’s because our brains are anticipating the rewards after, and we are uniquely capable of getting those things done. [22:10] BIG TAKEAWAY: Let optimism bias guide your goals and dreams. Whatever those big goals are, fill them up with as much optimism bias as you can muster, because confidence will get you there. [23:22] Set corporate goals with optimism bias, but set realistic tasks for your staff. [26:16] My interview with Karla Starr, author of Can You Learn To Be Lucky? [29:37] If you live as a confident person and think things will go well for you, (often) they will. [31:42] Formative years can instill how you believe about yourself. [33:09] Use optimism bias to your advantage to help you be lucky in life and business. [36:26] Join my Facebook live chat with Karla on February 13th – and ask your questions live! [41:16] Businesses will fall on either the light or dark side of this bias – and they need to market/message completely differently. Consider which side your business is on: light or dark? Make sure optimism bias works for you instead of against you. Emotional reactions to achievement outcomes: Is it really best to expect the worst?